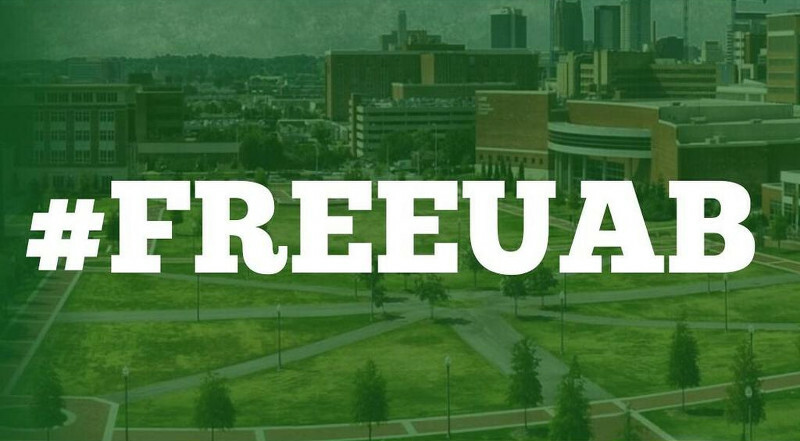 FreeUAB: A project to rally friends, family, alumni, and supporters of UAB athletics. UAB Football is under fire again! The Board of Trustees that is shared by Alabama, UAB, and UAH has a long history of undercutting the step-children programs at UAB and UAH. Notably, they have a history of threatening UAB Football and UAH Hockey. This week, some UAB alumni uncovered a plot by the board and their appointed UAB President Ray Watts to make a move to close down the UAB Football Program, despite UAB's winning record, much improved attendance, and highly popular coach, Bill Clark. Use this site to read about the unfair treatment of UAB Athletics by this group of "trustees" and see how you can stay engaged as UAB battles for its football program's future. Note, this struggle is NOT a battle between UAB and Alabama. The struggle is only with an unfair board of trustees. Many Alabama fans and alumni are supportive of UAB having the right to run its own affairs. We want a UAB that is free to be the best it can be without interference. So, we say "Free UAB!" BBJ: Poll: Would you support UAB having its own board of trustees? CBS Sports: Is the Alabama Board of Trustees Finally Ready to Kill UAB Football? AL.com: Why didn't the UAB president end 'speculation' that he might shut down the football program? Stay up to date with all the latest by joining BlazerTalk. Copyright © 2002-2014 Collegiate Sports Nation Bulletin Board System (CSNbbs), All Rights Reserved.